Premier’s reputation in orchestral music may be traced back to its very earliest years when soon after its inception in 1922, the company began to craft a variety of orchestral instruments to add to its highly sought after range of jazz drumsets. It didn’t take long before Premier led the way in the manufacture of timpani, tuned percussion and concert accessories. The instruments echoed the proud claims of quality for which the drum sets were already famous: BRILLIANCE - PERFORMANCE - RELIABILITY – DURABILITY. Premier instruments quickly attracted world-famous ensembles and musicians and were heard all over the world. 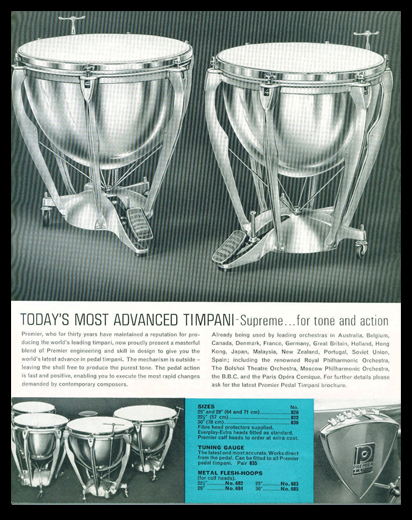 Premier timpani soon became the preferred choice of leading orchestras everywhere. At least one professional orchestra in every country has played Premier timpani and through so many proud and prolific endorsers, Premier became the leaders in the world of orchestral percussion. As well as the design and build of timpani, xylophones, vibraphones, marimbas, chimes, orchestral bells and orchestral snares, bass drums and toms, Premier also crafted its own tambourines, maracas, claves and castanets. Premier’s orchestral instruments have pioneered, supported and advanced performance on percussion in a way and for so many years, that very few other companies can claim. Eight decades of success and history have provided an inimitable wealth of specialist knowledge of musical instrument manufacture and inspires a passion and pride in everyone involved with the company. Percussion is used in so many musical genres and ensembles: classical orchestras, jazz bands, brass bands, wind bands, military bands, pipe bands, pop and rock bands and of course in percussion ensembles. Looking forward, Premier has a renewed commitment to the crafting of orchestral instruments of the highest quality and while always supported by our strong heritage, we continue to use the latest technology and creative inspiration to enable innovation to satisfy the demands of today’s players. Premier introduces hand tuned timpani, portable xylophone, glockenspiels and 1.0 octave chimes. 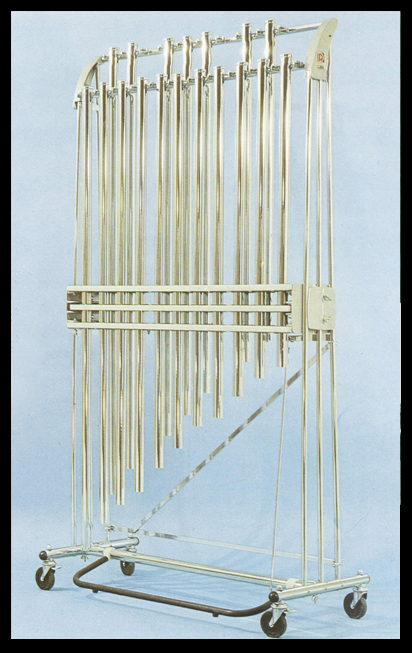 Premier experiments with variations of the glockenspiel, initially called the harpophone, before starting production of the ‘blue frame’ jazz vibraphone with motor and pedal damper. The hand tuned timpani are also developed into pedal timpani with an internal ‘spider’ and the famous ‘Premier Action’ Pedal. Production and development is interrupted by the War as Premier does its part for the war effort making precision metal parts. The factory is moved out of London and relocated to Leicester. Premier is involved in the initial development of synthetic timpani heads. The first portable timpani with fully suspended shells – the Premier Orchestral Timpani Series and the Premier Series I timpani featuring the Premier pedal action and other innovations are introduced. The New Era range of school percussion instruments is launched. A golden era for Premier with the introduction of the portable and lightweight ‘701’ (1.5” note bars) and world-beating ‘751’ (2” note bars) vibraphones. 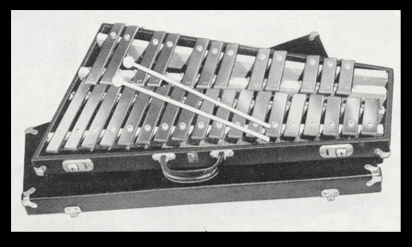 The ‘600’ 4.0 octave marimba and ‘500’ 4.0 octave xylophone are also developed. These instruments remain leading models throughout the world for nearly 40 years. The ‘860’ and ‘861’ Premier chimes are replaced by the innovative ‘0864’ (1.25” bells) and ‘0865’ (1.5” bells) models which featured a pedal system that “sustained” rather than damped. Both allowed for extensions of two notes at either end to extend the range. The new Premier Series II timpani introduces many innovative new features including the super-fast foot operated master tuning control – the ‘crown wheel’. Timpani and percussion moves into rock music with bands and artists such as Keith Moon (The Who), Carl Palmer (ELP), Brian Bennett (The Shadows), Phil Collins (Genesis) and others using timpani and often mallet instruments to enhance their performances. The world-class Elite timpani are developed for the highest levels of orchestral performance, a pioneering design featuring the now legendary extended head. The ‘crown wheel’ fine tuning device is redesigned to make foot adjustment easier and quicker. The Elite also featured square headed tuning bolts that are adjusted by keys, rather than the previous T-handles. Additional struts were introduced to the larger sizes and a counterhoop added featuring Premier’s famous diamond chrome plating. Two further series of timpani were introduced; the Popular Series of timpani for conservatoires, colleges, schools, brass bands, wind bands, field use and for those with a lower budget and the Series III, an upgrade to the respected Series II. The portable ‘0882’ xylophone, featuring synthetic note bars and a collapsible frame is launched together with the ‘Viscount’ range of student tuned percussion to complement the New Era range. Instruments such as the ‘500’ marimba, ‘600’ xylophone and ‘751’ vibraphone continue to take their pride of place in the range alongside ‘0570’ and ‘6801’ glockenspiels and new models such as the ‘0880’ and ‘0886’ portable xylophones. The ‘0865’ chime range is expanded to offer both chrome and brass models. The ‘O-Series’ of keyboards with synthetic note bars is developed specifically for the outdoor use of American style Drum Corps. Premier timpani are further improved with a new frame. The new Pro-Symphonic and Concert Series timpani replace the Series III and Popular Series respectively. Premier continues to innovate, expanding and improving its range of instruments based on the demands of the leading players in their field. The introduction of new models such as the Concert Aluminium timpani and the Recital Series and Orchestral Series keyboards help to strengthen the range further and offer musicians of all levels a quality instrument at a price to suit.